Preheat the oven to 425 degrees F. Prepare a muffin pan with cooking spray, if needed. I like to use a silicone muffin and then there's no need to spray. I also like to dust the muffin pan cavities with a little cocoa powder. Mix wet ingredients together until well combined: ripe mashed bananas, honey, egg, oil and vanilla. Add dry ingredients to wet ingredients: whole wheat pastry flour, cocoa powder, baking powder, baking soda, cornstarch and salt. Mix until just combined. Over-mixing will result in denser muffins. Stir in chocolate chips. I used 1/2 cup semi-sweet chocolate chips (Trader Joe's) and an additional 1/4 cup mini chocolate chips (Enjoy Life). 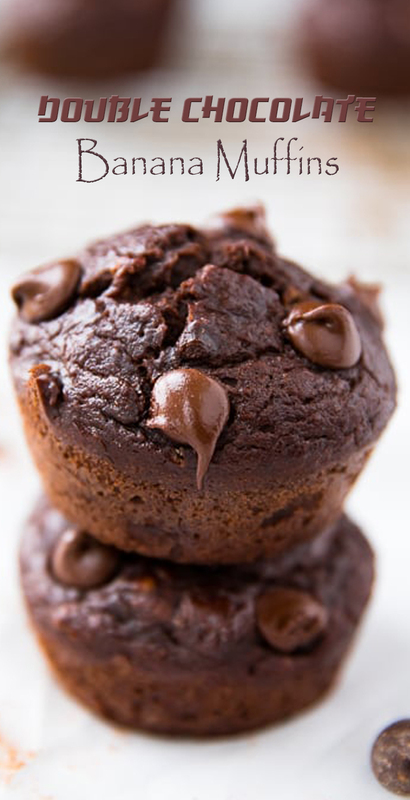 Pour batter into muffin cups (about a heaping 1/4 cup batter per muffin) and sprinkle additional 3 or 4 regular-sized chocolate chips over the tops of the muffins. Bake muffins for 5 minutes at 425 degrees F. and then with muffins staying in the oven, reduce heat to 350 degrees F. and bake muffins for 13-15 minutes more. The high heat will cause muffins to rise and then you will lower heat to cook the center of the muffin. Remove from oven and allow to cool in the pan for 10 minutes before transferring to a wire rack to cool completely.